Data breaches and theft are becoming more common, and much more dangerous. In late June, it was reported that nearly 340 million identity files were exposed by intrusion at Exactis. That’s virtually every adult in the USA! This is why the National Society of Accountants has partnered with VeriFyle to provide their VeriFyle ProTM service to our members for FREE-a $108 value! VeriFyle is a powerful tool for accountants and tax preparers, who are at risk due to the sensitive nature of sharing documents with their clients. Secure file transfer and communication is more necessary than ever, and VeriFyle provides a platform to interact, and share information, with their clients and colleagues. Client messaging and documents are stored in the cloud, locked down by 6 encryption keys for every object that is stored or shared. VeriFyle’s Cellucrypt technology uses password-derived keys on top of a public-key system to individually encrypt data objects, adding several additional layers of protection for their users. With the additional option to disable password reset, VeriFyle becomes the most secure cloud-sharing platform available, while remaining extremely simple to use. 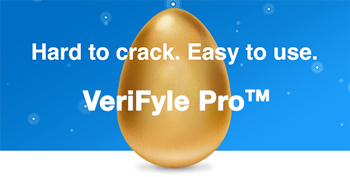 To get your free VeriFyle ProTM account, visit this page. You’ll be upgraded to Pro at no charge.